Precision. Originality. Durability. Qualities that capture the spirit of iconic Swiss luxury watchmaker Raymond Weil Geneve. Founded in 1976, this family owned company prides itself on its technologically advanced approach to timepiece technology. The brand has always been inspired and influenced by music, which marries mathematical precision with lyrical beauty. The collection names and limited edition releases reflect this passion: Maestro, Tango, Toccata, The Beatles and David Bowie. 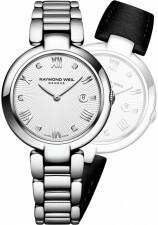 The men’s and women’s designer watches in these and other ranges offered by Raymond Weil are studies in technological and aesthetic perfection. Raymond Weil prides itself on designs that combine ergonomics, refinement and modernity. The company aims for distinctiveness and an identity-marked appeal. Choose a Raymond Weil watch to suit your personality and style. Invest in a masterpiece. This page is updated daily. This page was last updated on the . All Raymond Weil logos, symbols, images and trademarks are protected by copyright.